Republicans in Congress exempt from Obamacare repeal bill (updated). 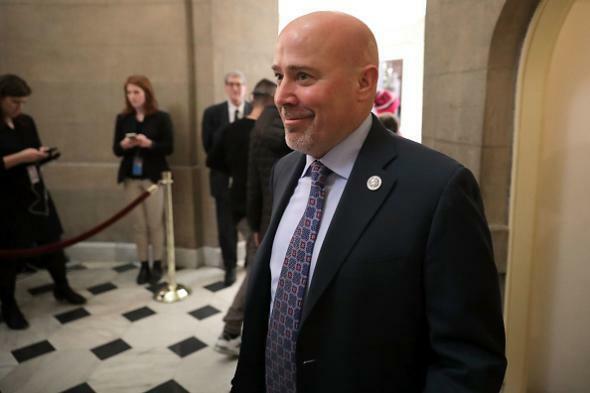 New Jersey Republican Rep. Tom MacArthur, author of the waiver that exempts Congress from the elimination of Obamacare protections for pre-existing conditions, at the Capitol on March 23. Update, 5:55 p.m.: Both the AHCA and the bill repealing the AHCA’s exemption for Congress passed the House today. The AHCA, however, could be passed through the Senate with only 50 votes because it’s part of the budget reconciliation process; the exemption repeal would require 60 votes. So Republicans will need Democratic votes to eliminate an embarrassing loophole that they created themselves. Original post, 10:34 a.m.: Last week House Republicans took a PR hit when Vox reported that the portion of the American Health Care Act that revokes Obamacare’s guarantee of coverage for pre-existing conditions includes a section that requires insurers to continue guaranteeing pre-existing condition coverage to members of Congress. The representative who’d proposed that section of the bill, New Jersey’s Tom MacArthur, subsequently claimed that he planned to eliminate the Congress loophole. Now it’s a week later, and what would you know—a vote on the AHCA is scheduled for Thursday, but the congressional loophole is still in it. Leadership aide says House will vote today on separate bill to fix Congress exemption. That bill, however, needs 60 votes to pass Senate. The 60-vote issue is relevant because the AHCA itself could be passed with 50 Senate votes through the budget reconciliation process. So, maybe the loophole will be closed, maybe it won’t. But right now it sure looks like Republicans in Congress are about to pass, on a party-line vote, a bill that would revoke health care protections for most Americans but protect them for Republicans in Congress.